Although the new Federal Overtime Law was set to start on December 1, 2016, a suit filed by 21 states gained ground when a Federal Judge halted the starting of the new law just a week before it took effect. The injunction placed a temporary halt on the new Overtime Rule charging the Department of Labor with overstretching its bounds by placing too much emphasis on the Salary Threshold. The new threshold was set at $47,476, a full $6,000 higher than the California Threshold, regardless of the fact that California has one of the highest cost of living in the country. When the new administration changed in January, the Department of Labor lost its more ardent supporter in President Obama. It is unclear how President Trump stands on the Overtime Rule Issue. Without intervention from President Trump, the case will proceed through the courts for a final ruling. Should the courts side with the Department of Labor in regards to the overtime rule, it could mean that the rule is backdated to December 1, 2016. If this happens then businesses could face the requirement to backdate overtime or increased salary pay or pay penalties for non-compliance. Track Hours of Exempt Employees under $47,476. Even though many business owners assume that the injunction halting the new overtime rule means that employees don’t have to be classified as non-exempt, they should take a few preemptive steps to ensure compliance should the courts rule with the DOL. First, any exempt employees whose salaries currently fall under the salary threshold of $47,476 should still track time worked. If the courts rule in favor of the 21 States, then businesses won’t need to backdate overtime pay. However, if the courts rule with the Department of Labor, then businesses that haven’t tracked these exempt employees hours from December 1 could be liable for backpay and still pay penalties for non-compliance. The situation gets more expensive when an employer has failed to track hours worked and can’t estimate the amount of overtime pay due to the employee. Reexamine Exempt Employee Duties Even if the DOL’s rule is upheld, the existing requirements around exempt employees and job classification still apply to businesses. The Department of Labor continues to increase the penalties for misclassification and increased the penalty as recently as January 2017. 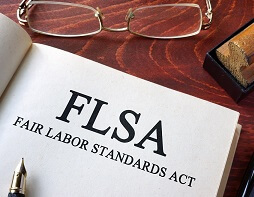 Employers should still take time to ensure that exempt employees are properly classified and performing the duties required for exempt status. Communicate with Employees Many employees expected salary increases or overtime to start in December. Even if employees weren’t directly informed by their employers, many were expecting a pay raise due to the media hype around the new Overtime Law. Employers should keep employees in the loop regarding current legislation and actions being taken by employers. Employers who had already informed employees of pay raises may not be able to pull the raises away from employees and should move forward with the raises. Human Resources needs to be aware and up to date on the current status of the Overtime Rule and be prepared to answer employee concerns and questions. Businesses who need to track employee hours can look to SwipeClock for easy and affordable solutions. SwipeClock provides a comprehensive array of workforce management and time tracking tools that can help businesses to more easily stay in compliance with local and national laws. Records are effortlessly kept for years and accrual is automatically tracked and reported to employees according to the state and city laws. Additionally, with geo-timekeeping clocks, businesses can effortlessly track time worked in specific cities to ensure compliance.